A little while ago, Australia, or at least the Sydney area, was in a pretty severe drought. Now, it has been raining for weeks. Literally. The flood of Noah has returned. This was June 8. Since then it has only given brief pauses of rain. It is depressing!!! I am sad (to confirm the status as depressing...) When will it stop!!! I challenge, no I beg everyone of the 4 or so people that read this blog to do a stop the rain for a week dance. The beautiful thing about this dance is that you get to make it up as you go as long as you do it while listening to or singing the old Blind Melon song. Please, I make this plea as a man humbled before the ancient clouds of suffrage which poured rain upon the brow of Noah! Before the peoples of the world whose perceived differences have, to this day, caused strife and enmity amongst our brethren! Let us, now, in the face of such atrocities, come to together to shed our blood for this most great cause and banish this blight from our once bright skies! Let us break bread together under cover of nothing but the Heaven's above such that the bread stays moist and dry. Dance I beg thee! Banish the clouds of rain for one week! Too much? Ya probably, but I need a break. I have recently made an interesting observation. Over the past while, the comments and views of my web-page have dropped considerably. I guess this is expected considering the crap that I put up on such a regular basis. Are you (mistakenly) waiting for something of substance to appear? Unfortunately for you, nothing of substance has ever been posted by me, and I honestly don't think that'll change anytime too soon. Another interesting observation though, is the timing of certain phone calls to certain members of my family pre-date the significant rise in readership by approximately 48 hours. I'm a scientist remember. I try to notice trends etc and claim them as my own!!! Mwaa haa haaa!!! Or, alternatively, I am mistaken and am posting things that you all seem to care a great deal about.... I'll buy that one. So thank you my loyal readers! And while my (and my family's) home will soon be in Halifax, NS, Canada as of sometime this December as I start work at Dalhousie in January 2008, I will still gladly post meaningless garbage for your reading (dis)pleasure. PS: Sorry about deleting a comment Connie, there were a few people here who didn't know yet, and I couldn't risk them finding out before we told them! 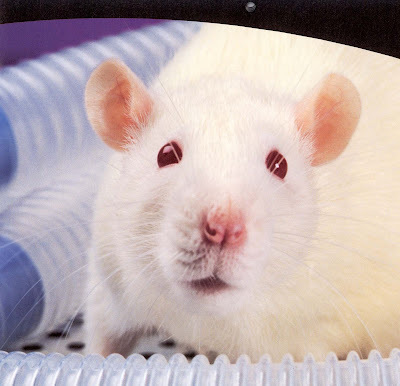 Well, I went down to do some work with some lovely little white lab rats (Wistars to be exact). Nothing bad though, we just wanted to look at them, teach our new PhD student (Anne) how to do a few things like put them to sleep etc. Nothing fancy. So Anne puts two lovely and well mannered lady rats into the perspex box where in a few moments they will be sleeping soundly and peacefully. So she goes to close the lid. The two ladies have decided that they were not tired. I should also mention that these rats are about 8-10 weeks old, and therefor still juveniles. And like a juvenile, when they don't want to do something, they cause a fuss. Soooo, the two lady rats proceed to simultaneously jump out of their cage just before Anne could close the lid, and run in separate directions. One ran towards Anne on the bench, the other away from me. Anne caught hers with little stress. I tried to grab my rat's tail, missed as it jumped onto a kind of ledge thingy at the back of the bench where it could have jumped to the floor and been even harder to catch. Since I couldn't get at the tail, I had to go for the body. I grasped (not too hard though) the lady rat around her body and carried her to her cage. This is where the problem arose. I felt an interesting sensation on my right pinky finger. Like something gnawing on it. Then it hit me. She's gnawing my pinky finger!!!!! One set of teeth (upper or lower?) chomping down on my finger nail, while the other piercing the arteries in the tip of my pinky finger. I couldn't do much about it so I continued to put her in her cage where she remained for a while. So I washed the wound which was gushing forth blood at a rate of at least approximately 1 litre per minute (I didn't measure it at the time, obviously, but I am a scientist, so not prone to exageration (just spelling errors), so I think I'm right). Anyway though, I washed the wound, tried to stem the tide of blood now filling the room to flood levels, filled out the incident report form because it was the right thing to do, then called Staff Health here at the hospital. Remembering that I work at a HOSPITAL!!!! And I had a genuine incident where I was bitten by an animal which did draw blood, and that there was a significant potential for infection (bacterial) as the teeth did go deeper than they should have, I would have thought that STAFF HEALTH could have done something. But nope, they told me to go across the road to a private clinic and get it looked at properly because all STAFF HEALTH! could do was put a band-aid on it. What a friggen joke! I am staff. At a hospital. Yet STAFF health could do nothing. Anyway though, short story long, I took care of the wound properly to begin with, so the doctor had a look at the bite marks, the scratches and indentations on my finger nail as well as the 32 mm deep hole in the my pinky finger, and prescribed some antibiotics as preventative. I'll end this story now. Rarely am I as appalled as I am now about the behaviour and actions of a few utter and complete morons that have perpetrated acts of barbarianism. Such people I openly challenge them to properly identify themselves as human beings. Come forward. And pay penance. Unfortunately, I am not ranting or raving. On the south coast of NSW, around Bateman's Bay, (ie north of the land of milk and honey and fish, Moruya) three kangaroos were found. One with its eyes gouged out and a its baby Joey still in its pouch (now struggling for survival by carers at a meagre 900g). Appalled, simply appalled that is supposed to be noble (like a human) can act with less dignity and respect than that afforded to a starving pig at feeding time. How do you look at your selves in the mirror? How do you look at your own hand's? How do you sleep? I'm sorry I had to post this, but there is never any reason for such animosity. Yup. The price of a father's love is apparently equal to the price of a Classic Cobra. Yesterday, me, my wife, my 6 month old daughter, and my 4 year old son Alex were driving down the coast to Wollongong (about 45 min south of where I live). On the way, there was a whole bunch of classic cobras along the side of the road. I have seen this conglomerate of beauty before and know it to be a car club consisting of people who own said cars. So I asked Alex what he would rather have, jokingly, Mommy or one of those cars. A mean question, I don't really know, but it was funny nonetheless... Initially, he said the car. And then we told him that that would mean that he wouldn't have Mommy anymore and all the nice things that goes along with Mommy. He recanted and decided that he would rather have a Mommy. The time was approximately 11 am. So we did our shopping in Wollongong, went home, had lunch, kids had a bit of a nap, then we went to visit Rebecca's sister Amanda. Time now, approximately 3:30 - 4pm ish. On the road, out of the blue, Alex states that he would swap Daddy for the car. He caught me off guard with that one and it was hard to not laugh out loud!!! We tried to convince him that a car for a Daddy was not a good trade... But it didn't work. 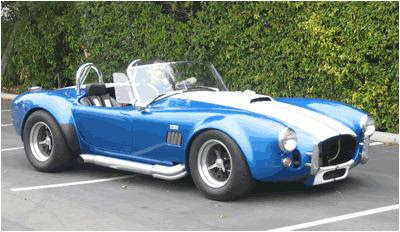 So, I am soon to be traded, or sold, to buy Alex a Classic Cobra. Despite the fact that he is only 4 years old, he demonstrates such great taste in cars which makes me proud. And I am not really sure that he has made a bad choice... I am at work (including on the way to and from) too much, while Mom is at home with him; that car is very easy on the eyes, ears, touch, and smell, while I, simply put, am not.